If you were to think of an Irish rebellion, the first things that might come to mind would probably be the 1916 Rising and Michael Collins. You'll learn about that at the start of Third Year. Before 1916, there were other, smaller uprisings, which were all unsuccessful. One of the most famous of these happened shortly after the American and French revolutions, and is known as the 1798 Rebellion, after the year in which it took place. 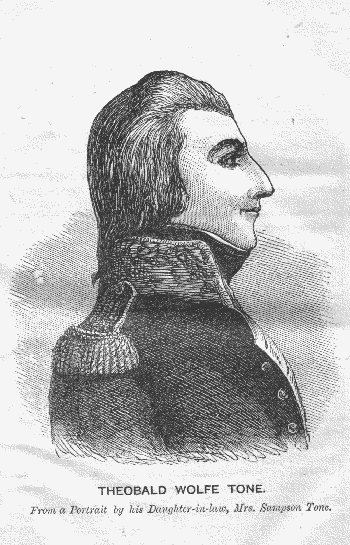 Wolfe Tone is the man who led this rebellion. He tried to get help from the French, but stormy weather sunk that plan. *Wolfe Tone (People in History)* and the United Irishmen. The arrest of the leaders. The 1798 Rebellions: Wexford, Ulster, Connacht. The failure of the rebellions. The results of the rebellions. Because this is the Irish Rebellion page, the answers below talk about Ireland and Wolfe Tone. For America or France, go to their pages. This centre, in Co. Wexford, has exhbitions and displays about the United Irishmen and the battles fought. Visit it if you're in Wexford! It's a long read, but the story of the rebellion is told here in great detail. The National Archives has some primary source documents saved as PDFs for you to view on your computer. See the handwritten United Irishmen oath here, amongst many other things.